This is a side dish and a favorite chaser or mazeh among many Iranians; it goes particularly well with the Iranian hard liquor, aragh. A mazeh should be spicy and delicious of course, and should ideally contain a lot of protein. Charcoal-grilled lamb’s liver (jegar) for instance is another renowned mazeh. In Iran, Kidney beans dish is by tradition prepared and sold by restaurant, bars (when we had them) and street venders. However, khoraak looia is very easy to prepare at home; it is nutritious, tasty and always good to have as a side dish, or even on its own. 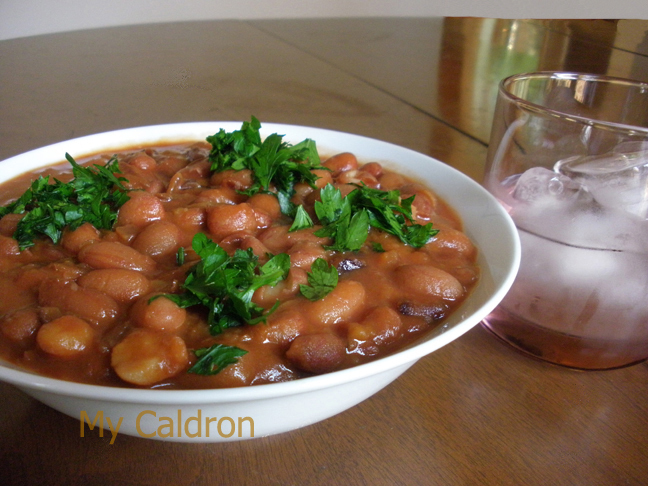 Roman beans (or kidney beans), 1 cup. Red or white onion, 1 large, diced. salt, pepper, and cooking oil, and water as required. Method: Wash and soak the beans overnight. Discard the water and cook with fresh water and a pinch of salt until done (but not mushy). Soaking helps speed up the cooking process and diminish the gas. If soaking is not an option, bring the water to a boil and discard at least once before letting the beans cook. The amount of water you need to cook the beans depends on several factors including how hard the beans are. Remember, at the end of the process you should not have much juice left. Fry diced unions in oil until golden. Add this piaz daagh, tomato paste, lime juice, mustard, and suitable amount of salt and pepper and cook only for 2-3 minutes till all tastes are mixed. It is ready and can be served hot or cold.